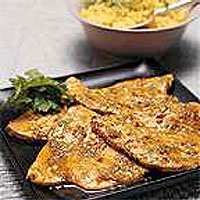 The hot and spicy marinade, known as chermoula, gives these meaty tuna steaks plenty of flavour and colour. Serve on a bed of couscous with a fresh green salad. Mix together the ingredients for the chermoula, add the tuna steaks, cover and marinate in the fridge for 1-2 hours or overnight if possible. Arrange the tuna in a roasting dish, overlapping the steaks, then roast in a preheated oven at 180°C, gas mark 4 for 30-35 minutes until cooked. Serve the tuna on a bed of Waitrose Garlic and Coriander couscous and garnish with lemon slices, fresh coriander and green salad. Instead of chermoula for a marinade you could use gremolata which is a mixture of 4tbsp olive oil, 3tbsp chopped parsley, 2 cloves of crushed garlic, zest of 2 lemons and salt and freshly ground pepper.